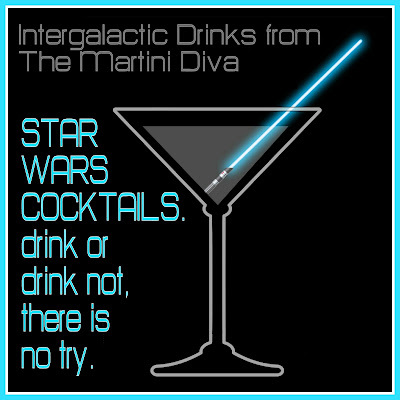 For all of you Rebels and Stormtroopers out there here's four original Star Wars themed cocktails to enjoy while traveling the galaxies. Pipe a thin line of the cream cheese frosting on the rim of martini glass. Dip into the cinnamon/sugar mix. Chill glass in freezer. Add 1 Cup of ice to a cocktail shaker, pour in the cake vodka, half & Half and the cinnamon schnapps, shake until well blended then pour into chilled glass. Garnish with a Cinnamon Stick light saber. Layer the liquors in a tall shot glass (shooter), add the 3 drops of chocolate bitters, top off with a cone of whipped cream and place mini chocolate chip on top. Pour the gin, lemon juice, and simple syrup into a Collins (hi-ball) glass filled with ice cubes. Stir, then fill glass with soda. Drizzle the Blue Curacao over the top, swirl glass and garnish with the Twizzler. Muddle the blackberries, leaves from 1 sprig of tarragon, lime juice & simple syrup in the bottom of a Boston shaker, then add the ice and rum and shake hard. Double strain into chilled martini glass and garnish with the other sprig of tarragon and the fresh blackberries.